A Greenville, North Carolina, waitress got the surprise of a lifetime after a customer left a $10,000 tip over the weekend. The generous patron turned out to be YouTube star Mr. Beast, and he made the Sup Dogs server's day Saturday when he gave away $10,000 in cash, CBS affiliate WNCT reports. 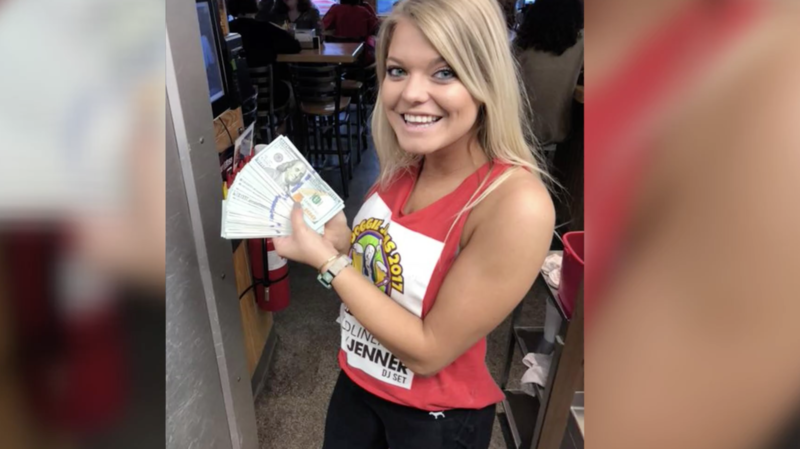 According to Sup Dogs owner Bret Oliverio, the man ordered two waters from server Alaina Custer, took a few sips and dropped the cash on the table before leaving. Oliverio couldn't believe it. "Good people are still doing good things these days so I thought it was really, really cool," Oliverio told the station. "I've seen some really big tips but not $10,000. Custer, who attends East Carolina University, initially thought it was all a prank. "I literally didn't think it was real," Custer told the News & Observer. "I picked it up and it was a giant stack of hundreds. I was shaking and just kept asking Brett, 'What is this?' I thought someone was playing a joke on me." She was in so such shock that she didn't even notice that there were two men capturing her expression as it happened. Mr. Beast, who has more than 8 million subscribers on YouTube, is known for donating money to unsuspecting strangers and filming their reactions on video. "This was out of the blue, once in a lifetime," Oliverio said. "It'll never happen again in my lifetime." As for the money, WNCT reports Custer is taking a chunk of it and splitting the rest with her coworkers.